In 1937 Pyotr Kapitsa and John F. Allen discovered a strange behavior of ultracold liquids known as superfluidity. A superfluid is a fluid with no viscosity, basically a frictionless liquid. Without viscosity, the fluid has no way to dampen its motion. Because of this, superfluids have some pretty unusual behaviors. If a bit of superfluid is suspended in an open container, it will creep up along the walls, then drip down to a lower container. It can flow through tiny pores that regular liquids can’t, and can create fountains that could flow forever. This seeming defiance of gravity and common sense is due to the fact that its behavior is rooted in quantum physics. 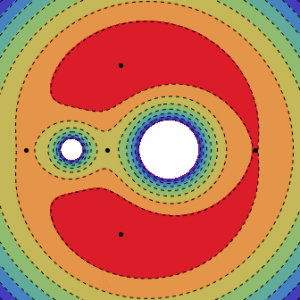 Though it is not a truly quantum state such as a Bose-Einstein condensate, it shares some commonality with it. In the lab, superfluids are only seen at temperatures barely above absolute zero. The most common example, helium-4, becomes superfluid when cooled below 2.17 K. So it might seem odd that superfluids are also found in the hot interiors of neutron stars. A neutron star is a stellar remnant formed with a star runs out of hydrogen and heavier elements to fuse. After a star explodes as a supernova, the remaining core of the star collapses under its own weight to the point that only the pressure of nuclei can counter the force of gravity. A neutron star has a mass of about two Suns, but are only about 20 kilometers in diameter. They have a dense atmosphere of carbon only a few centimeters thick, and a thin crust of iron nuclei. In the interior of a neutron star, nuclei are pushed together ever more tightly, and reach a point where the nuclei can’t hold themselves together. As a result, individual neutrons “drip” out, and sink into the star’s core, forming a neutron fluid. As a neutron star cools, this neutron fluid transitions to a superfluid state. This happens not at a few degrees Kelvin, but at 500 to 800 million Kelvin. The interior of a neutron star is a hot superfluid sea. When the interior transitions to a superfluid, the temperature of the star’s surface can drop dramatically, as has been seen in the neutron star of Cassiopeia A. Once the interior is superfluid, it can significantly affect the star’s behavior. Neutron stars have strong magnetic fields, and coupled with their fast rotation they radiate intense radio energy (which we can sometimes see as pulsars). Because the crust of a neutron star is magnetically pinned, its rotation gradually slows down, but the superfluid interior has no viscosity, and doesn’t slow down. Over time this means the interior can rotate much faster than the outer crust. Eventually the difference between the two becomes so great that some of the rotation is transferred to the crust, causing it to speed up quickly. In pulsars this is seen as a glitch in the rate of its radio pulses. These glitches can be used to determine the mass of a neutron star. Perhaps what’s most amazing about all this is how two radically different materials can share such similar properties. 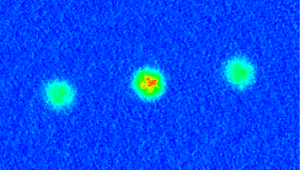 Ultracold helium and superhot neutrons both acting as a strange quantum fluid.